You can read and/or download Dog Star for free. Click here and then save the .pdf file to your computer. My good friend and often co-writer “J” (not his real name) had a pal, “C” (not his real name) who was an up-and-coming agent who had worked with a couple of the biggest firms in town. C told J that he would like put his energies behind a story about a fellow who, while his marriage is disintegrating, becomes very close to his dog, and that saves him from complete destruction. J and I (not my real name – but a descriptive first-person pronoun) put a lot of time into coming up with a story based on that notion. At times the dog had the ability to speak. Maybe he sounded a bit like George Burns, or maybe Adam Sandler. Long story shortened a bit – I was just simply unable to come up anything that I felt I could do properly with this story. My apologies to both J and C. There is probably a terrific movie wrapped around that idea, but I wasn’t the guy to write it. 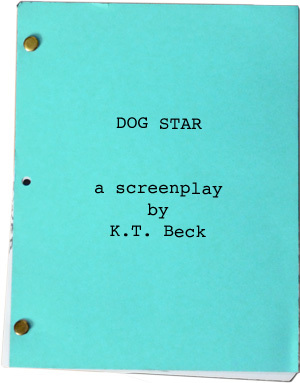 However, in the midst of that process, this whole other dog-related piece came bubbling up and became Dog Star. Man, I love this script. It’s gentle. It’s wise. It isn’t about a talking dog. The talented little mutt doesn’t do anything that is not within a dog’s physical abilities. But he’s a damn special dog working a very nice little bit of real world magic on a lovely little town. Many people have read this. No one has shown the slightest interest. It’s a bit hard to sell in a sentence. It’s not truly a comedy. But it’s lighter than a drama. No shooting. No fighting. No car chases. But lots of different angles on the Great Mystery that is Love. And an enticing little mystery at the very center of the soufflé that works like a charm.